I started blogging to learn new things and save good recipes I used. It works really well for me, I often tend to browse through my archive to find a recipe I used to make, but there is a lot of small tips and tiny recipes that tend to be lifesavers, but I barely ever share them here, as they seem obvious, but they didn’t use to be for me! I’m not an organized cook. We always make the same mistake during the weekend, we have nice lazy morning with big late breakfast and then we go for a walk, or shopping, etc. Then we come home, it’s around 4-5pm and we are starving, because is long after lunchtime, there are two solutions, one of them it to buy something easy to fix like frozen pizza, but I feel bad after it, but we do it sometime anyway. Other solution is to make a easy salad and prepare proper meal later on. A salad keep us full for an hour or two and can be done in 5 minutes. I actually got idea of salads before dinner from Tomek’s aunt that lives in Paris and always serves them before a main meal. In Poland as a first dish you usually have a soup, and a simple salad goes as a side rather than full meal. But a salad before a main dish works miracles for me. It adds veggies to my diet (I’m a carb addict), as it’s a separate meal, so it doesn’t need to match the main dish and it uses leftovers. veggies, it’s really up to whatever you have in your fridge. I always feel like a rabbit, when I eat too many leaves so I try to add some texture and flavour. I love tomatoes, so usually have some, but during winter when tomatoes are tasteless I prefer to go with something like marinated peppers or olives. cheese or meat, it gives some bulk and keep you full, I love cheese, so I try to have either blue cheese, feta or goat cheese in my fridge, worse case scenario there will be cheddar (I always have cheddar). You can replace cheese with meat or add them both. You can fry diced chorizo or just dice ham or cooked chicken leftovers. seeds or nuts, I use whatever I have in my pantry, usually it’s sunflower or pumpkin seeds, almonds, walnuts or cashews. But any nuts will work. I would recommend to toast them before, but when I’m in hurry I just throw them on the top without toasting. dressing, the simplest dressing would be just a drizzle of olive oil and some pepper and salt, you can add balsamic vinegar. But what convinced me into salads was actually a dressing, thick, tasty, full of flavour dressing. Recipe adapted from “Smak życia” Agnieszki Maciąg. 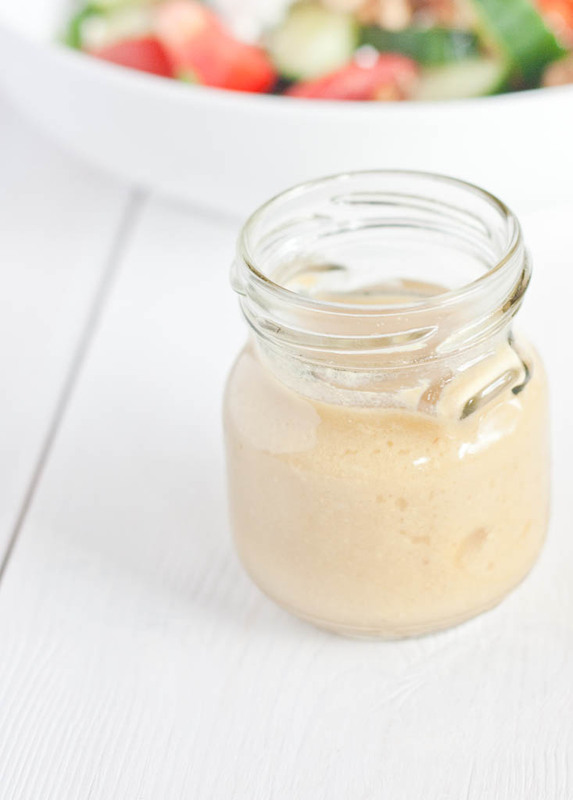 Whisk together mustard, vinegar, garlic and honey until combined in a small bowl. Slowly start pouring olive oil whisking all the time. Whisk until the dressing will be fairly thick. Posted in Salads and veggies, Spring, Summer and tagged dressings, garlic, honey, mustard, olive oil, vinegar. Bookmark the permalink.